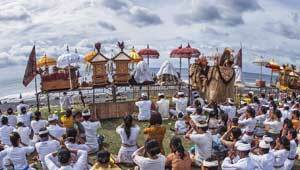 Melasti Ceremony is a Hindu religious ceremony performed 3-4 days before NYEPI (Balinese Day of Silence) . It is dedicated to Sanghyang Widhi Wasa. 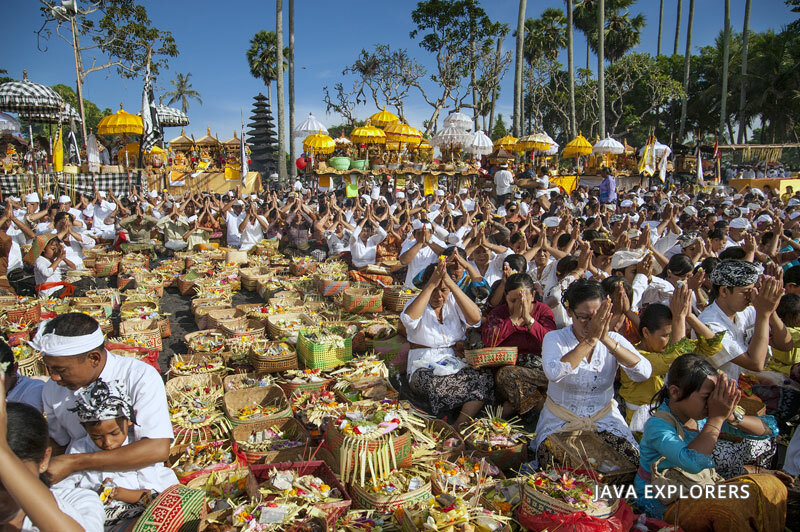 The ritual is performed in Pura (Balinese temple) near the sea (Pura Segara) and meant to purify Arca, Pratima, and Pralingga (sacred objects) belonging to several temples, also to acquire sacred water from the sea. 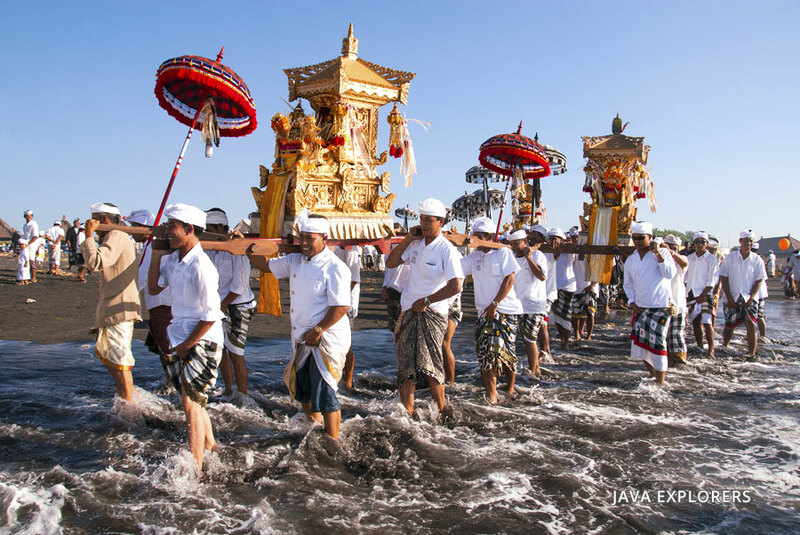 Before the Balinese Hindu people perform NYEPI " The Silent Day of Hindu's " there is a ritual of praying which have to be done that is called "Melasti" or "Melis", a ceremony to clean up "pratima"-the sacred property of the temple-at any nearest water fount, such as sea as well as lake. 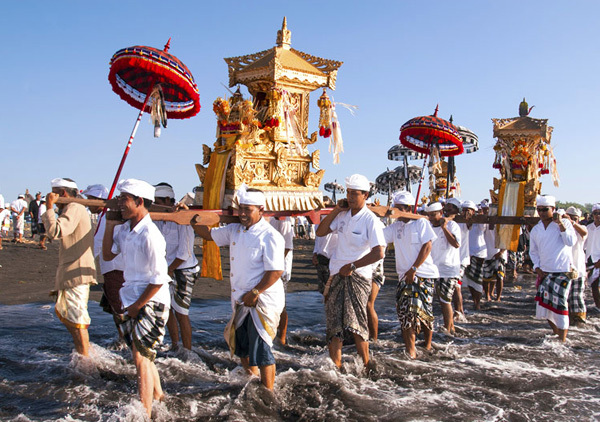 People of Balinese Hindi who live around beach usually perform the ceremony "Melasti" with seawater whereas they who live around the mountain usually perform it by the lake water. "Melasti" was held at almost every beach in Bali. This is done because in accordance to the purpose of this ceremony where before Nyepi Day. 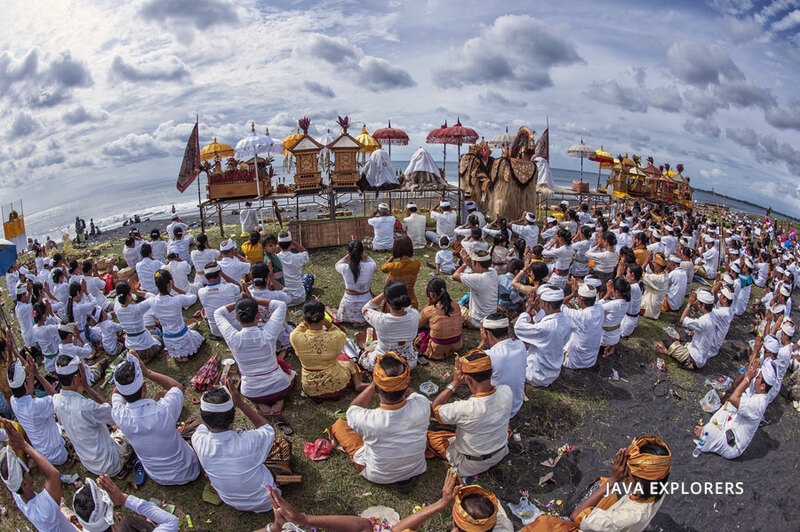 Melasti Ceremony is purifying Bhuana Alit (small world) and Bhuana Agung (the universe). This ceremony is performed with a parade procession followed by thousand of Hindu people by bringing all the equipment ceremonies and the symbol of gods to the sea or other water sources that are believed by Hindus as a place to purify all the elements of this universe. 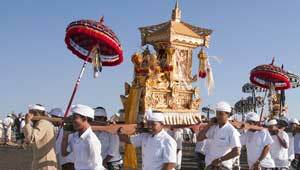 The usual symbols of gods brought to the sea are Keris, spears, banners (Umbul-umbul), statues, Barong etc. This procession is one of the unique Hindu ceremonies where the procession was followed by thousands of Hindus who wear the clothes and other accessories in white to indicate the purity. All the elements at Bhuana Alit and Bhuana Agung should be clean and pure. 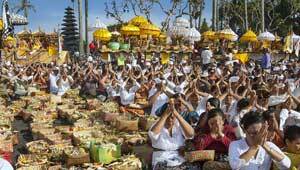 This is very important because the feelings / heart clean and pure, we can implement Nyepi Day perfectly. People of each "Banjar" alternately walking carried each of their "pratima" for some circling. A flamboyant banners, magnificence flags, serenely traditional umbrellas, various antique package of offerings, and more sacred symbols of each of temple was lifted up above their head, momentary impressing a gush of majesty, splendor, and vigor of them those were celebrated 'respected' yet full of humility in a folksy way, solemn, and almost silent.